Lemon Diet to lose weight in a few weeks. The ultimate detox machine for the body. 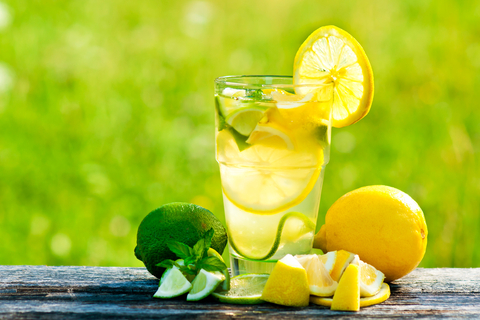 The extreme liquid monodiet plan, also called Master Cleanse Diet dwells in bounteous use of only lemon juice for about a fortnight with herbal laxative tea at bed time. It is glorified for its instantaneous weight loss due to its stringent calorie deficit. The very low calorie diet propels an overweight or obese individual with prompt depletion of stubborn pounds. Such drastic and urgent weight loss can be recommended to improve obesity-related complications (risk of diabetes, high blood pressure and high cholesterol). The dieter initiates other simple food items like vegetable soups only after a couple of weeks of lemonade diet. This may be augmented with other fruits and vegetables, gradually incorporating solid foods. The diet lacks essential nutrients – vitamins (other than Vitamin C), protein, carbohydrates, fiber and fat. If you think shedding weight is this simple, think again! This dandy affair of unbalanced food intake with just variations of plain water, mint tea or lemonade, might weaken the digestion and immunity, instigating a ravenous appetite which would bring the pounds back on. The stringent fast has debilitating effects like muscle loss and fat gain. The side effects of severe fasting – headache, fatigue, dizziness, sluggishness, diarrhea, nausea, constipation or loss of good gut bacteria – are not uncommon. In spite of the immense popularity of the Lemonade diet, research is yet to authenticate the credibility of this practice touted for detox. A healthier version would be cleaner choice from nature, without refining and processing, that conserves the nutrients and is void of chemicals and preservatives. A fortnight of organized very low calorie eating with adequate aqua, whole grains, fruits, vegetables, lean protein, low-fat dairy, beans and good fats like omega and MUFA within 1,200 to 1,500 calories per day packs off up to 3 pounds a week. This kind of healthy eating plan is not too restrictive, satiates hunger and focuses on getting in more fluids and fiber that regulate bowel movements which aid cleansing.